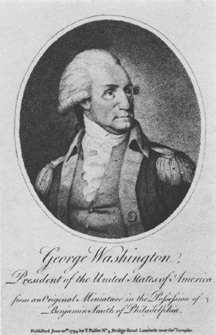 George Washington, / President of the United States of America. / from an Original Miniature in the Possession of / Benjamin Smith of Philadelphia. / Published June 10th. 1794 by T. Palfer No. 4 Bridge Road Lambeth near the Turnpike. Version II: As shown, but before any letters. Version III: As shown, but with publication line changed to "London, Published by D. Rymer, Book & Print Seller, 10. Broad Court, Long Acre." Note: Hart says this is a made-up picture with only the Savage head. See also Wick, pp. 106-7.